What exactly is in your dog's treats? This is an example what you will find in the Dog Gone Good Barkery treats. I'm baking today! I pulled out this sampling of what goes in the cookies and I'm wondering if my dogs are actually eating better than I am? We all know how much dogs love peanut butter and bananas. A favorite treat of many canines. Not only is peanut butter a good source of protein, but it also contains heart healthy fats, vitamin B, niacin, and vitamin E. Bananas are a great source of potassium, magnesium, vitamin C, vitamin B6, fiber, biotin and copper. Bananas help boost the immune system, replenish electrolytes, and promote skin and coat health. You will receive a 1 lb. resealable bag of Peanut Butter Banana Bones. The treats are approximately 2" long. 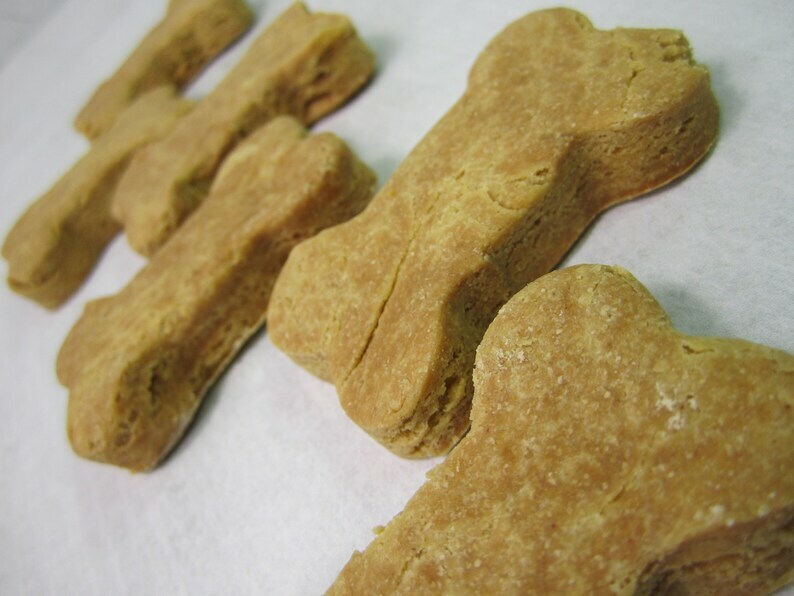 These Peanut Butter Banana Bones are made with chickpea flour so they are wheat free.